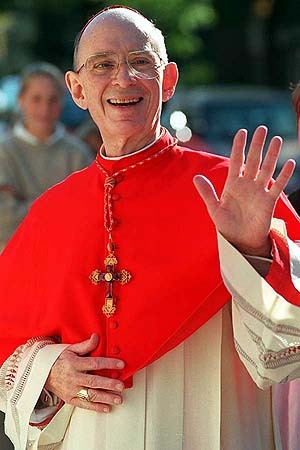 Today (November 14th) marks the fifteenth anniversary of the death of Joseph Cardinal Bernardin (1928-1996), who served as Archbishop of Chicago and president of the US bishops’ conference. In his ministry, Bernardin served the local, national, and universal church with all the energy of a missionary. He faced personal attacks and false accusations against him in a spirit of humility. With his life and ministry cut short by pancreatic cancer, the eminent church leader bravely faced death in a public way that gave hope and comfort to many suffering with cancer. Despite the continued unfair criticisms waged against him, I believe that Cardinal Bernardin was the most important and visionary cardinal in the history of the American church. Given the continued divisions, polarizations, and problems facing the Catholic Church today, Bernardin offers us an important twofold witness. On December 6th, 1983, Bernardin delivered the Gannon Lecture at Fordham University in New York (Go Rams!). The lecture took place shortly after the release of the US Bishops’ pastoral letter The Challenge of Peace: God’s Promise and Our Response under his leadership of the committee that drafted the controversial document. Later, Bernardin takes a term “the seamless garment,” coined by the lay peace activist Eileen Eagan to describe this consistent ethic of life position—“from womb to tomb.” The notion of the seamless garment, is taken from John 19:23 in reference to the seamless garment of Jesus. Just a few months before his death in August, 1996, Bernardin launched the Catholic Common Ground Project. In October, the cardinal delivered one of his last public addresses at the first meeting of the project. Since 1996, the Catholic Common Ground Initiative has taken on a number of actions to facilitate dialogue, communion, and a sense of common mission within the church. From its new home at the Bernardin Center at the Catholic Theological Union in Chicago, the Catholic Common Ground Initiative continues this important work. (www.catholiccommonground.org). What is the state of common ground and dialogue in the American Church today and society more broadly? How do we witness to the consistent ethic of life? What can we do to facilitate common ground in the Church locally, nationally, and globally? While some may feel that these issues are things of the past, the present political discourse in the lead up to the 2012 election highlights the continued relevance of both the consistent ethic of life and the search for common ground. I’ll end this brief conclusion with a quote from the end Bernardin’s wonderful reflection, The Gift of Peace, written just thirteen days before his death from pancreatic cancer on November 14th, 1996.